Another month, another mysterious subscription box. 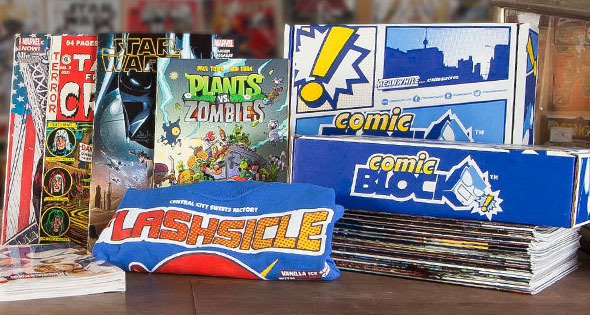 Which items will we find in the Comic Block of July? Is it going to be filled with treasures? The obvious answer is yes, otherwise we wouldn’t be buying these mystery boxes but what kind of collectibles will we get this month? It’s a question that keeps us going day after day while we wait for the next subscription box to arrive at our doorstep. That is the thrill we all seek in any kind of mystery bags and boxes really. Do you remember as a kid that you always wanted those mystery bags at carnivals simply because curiosity got the better hand? The subscription mystery boxes are bound to retrieve that exact feeling. Simply find one that offers a theme that you will like and pay the price. There are tons and tons of companies offering these mystery blocks but not all can offer the quality of subscription boxes such as Nerd Block and Lootcrate do. Each box can vary in cost and frequency but the general concept will be on par with the others. Once all payments have gone through, the company will ship the box out to you and you’ll have to patiently wait until it arrives at your doorstep before you can tear it apart like a racoon. Nerd Block offers several themes such as Classic, Arcade, Sci-Fi, Horror, Comic and Junior boxes. They added a new line of subscription boxes, namely the Shirt Block. As always, we will be reviewing the Comic Block which includes the mandatory T-shirt and a few comics but enough chit-chat, let’s see what’s inside. 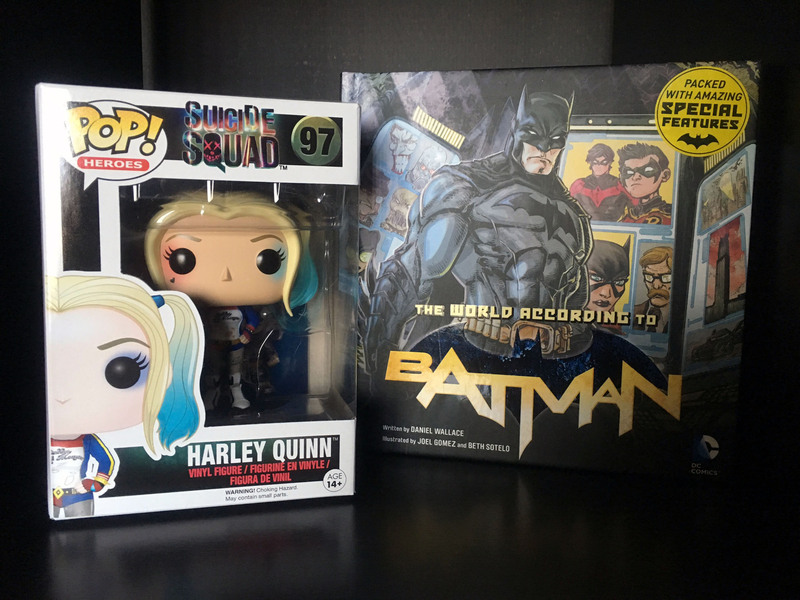 This month’s box seems heavily packed with DC Comics, be it from the newest super villain movie Suicide Squad or Batman. 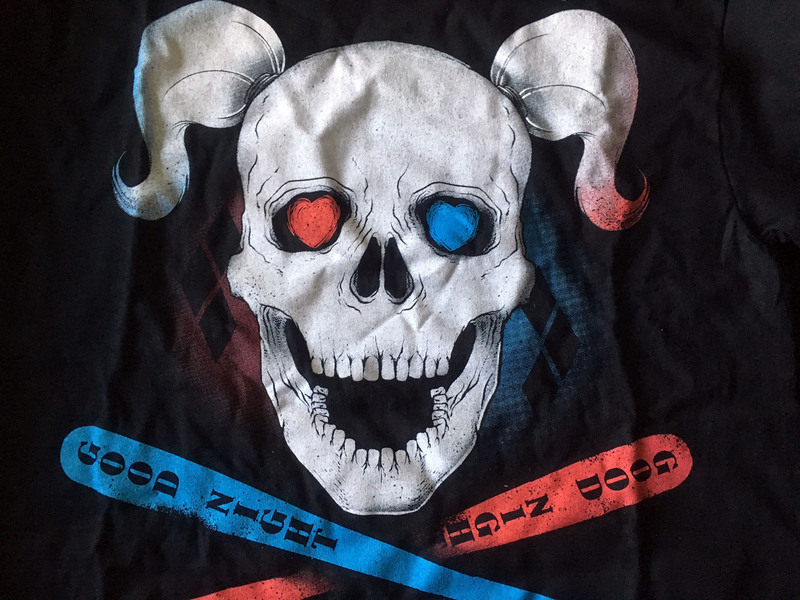 The exclusive Suicide Squad shirt features a great design of Harley Quinn and her “Good Night!” baseball bat. We’re a tad unsure of the skull design but it’s probably a safer bet than faces of actors. Once again this shirt is from ShirtPunch who always deliver quality shirts with a good fitting. These shirts usually go for $10 so we’ll be going for that price as well. Next up we have a Funko Pop! 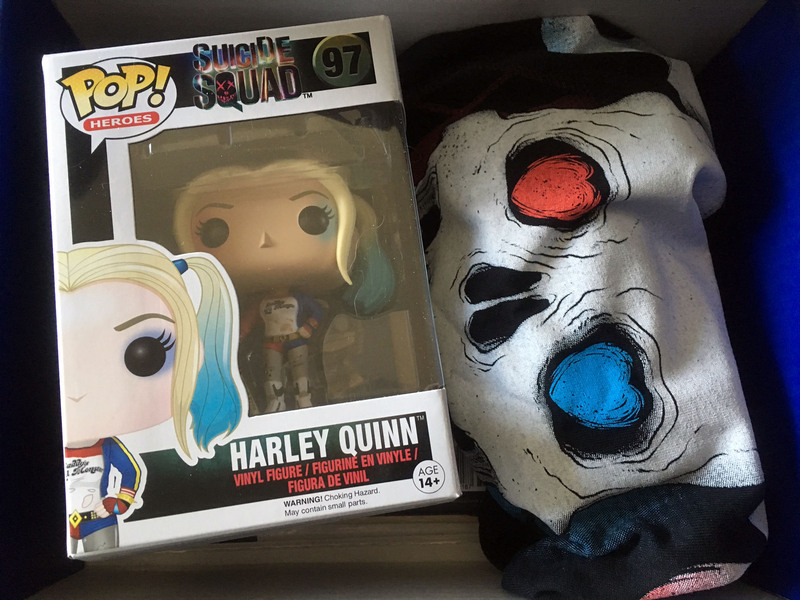 Heroes vinyl figure of one of four characters of the newest Suicide Squad movie. You could have gotten The Joker, El Diablo, Deadshot or Harley Quinn. We’ve gotten the latter and she is absolutely gorgeous. Even her small heart tattoo below her eye is clearly visible. The Funko Pops usually go for $10 to $15. The small booklet next to the vinyl pop is titled The World According to Batman but you could have also gotten The World According to The Joker. In this hardcover book, you get to experience the Dark Knight’s amazing world in a first-person experience, starting with the tragic origin story of Bruce Wayne to the crime-fighting anonymous Batman. Filled with graphical illustrations from the comic books and biographical information as well as factoids, this is a must-have for any fan of the Dark Knight himself. It may be compact in size but it is filled with his darkest secrets. These hardcover books easily go for $20. Lastly we have the sole reason for the Comic Block, namely the comics themselves. This month buyers received an exclusive variant comic of Doctor Strange #1 from Marvel, a series we have yet to follow. As the cover already reveals, this is the prelude and these comics go for $3.99 retail price. 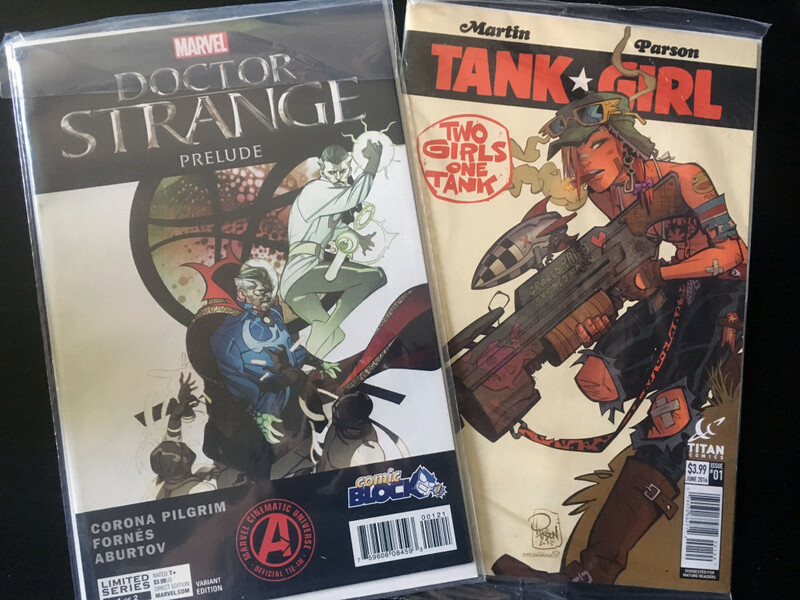 The box also included a random bonus variant comic and we were bummed that we had received yet another copy of Tank Girl: Two Girls One Tank which is also priced at $3.99. If you don’t remember, we had already received this variant cover in May’s Comic Block so this was a huge let-down. Although the value exceeds last month’s comic block, we could not help but feel slight bummed at the box in general. This is the second box in a row that featured only five items, including the obligatory T-shirt and to top it off we received a variant cover that was already part of May’s comic block. The value of the contents doesn’t quite seem to match the promised value either so we are hoping that next month’s block is more promising but seeing as August’s comic block will feature 3 comics, 2 exclusive wearables and 1 exclusive cover with themes such as Suicide Squad, Guardians of The Galaxy and Harley Quinn, that should be no problem.